Brooklyn's best are coming to Manhattan. 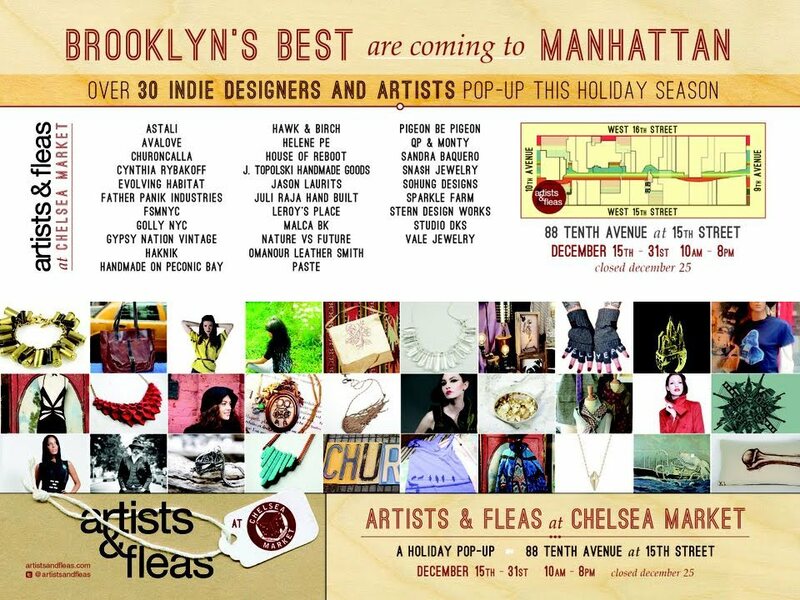 Save the date for Artists & Fleas at Chelsea Market! December 15th - 31st. Click on this flyer for more information. 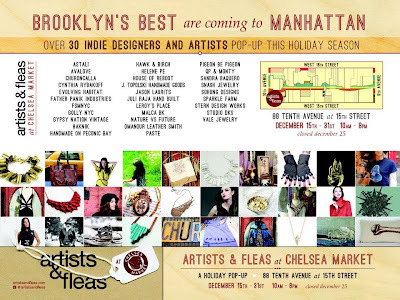 Beginning December 15th, Artists & Fleas brings the best of Brooklyn to the heart of hip with a 2-week long holiday pop-up at Chelsea Market. Artists & Fleas at Chelsea Market is an opportunity to showcase a selection of hand picked artists and designers in NYC, since first opening their doors in Williamsburg in 2003. 30 crafty vendors, including Cynthia Rybakoff fine fashion jewelry, and Handmade on Peconic Bay modern vintage prints, will be transforming a never-before-seen 4000 square foot industrial space on the corner of West 15th Street & Tenth Avenue into Manhattan's best holiday happening. The venue sits at the cross-roads of fashion, culture and urban innovation – nestled beneath the High Line park and between the the Meatpacking District, Chelsea, the West Village and the Hudson River waterfront. Chelsea Market is known around the world as much for its creative use of urban space and architecture as it is for exciting retailers and cosmopolitan food makers. Artists & Fleas at Chelsea Market is located on the NE corner of 15th & 10th. Accessible via the Chelsea Market corridor near the 10th Avenue entrance, and doors on 15th & 10th. Map it!